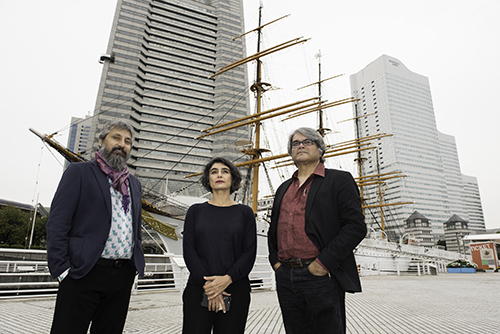 It is with great pleasure that we announce the appointment of Raqs Media Collective as the Artistic Director of Yokohama Triennale 2020. The selection process, which began with a shortlist of prospects based on a number of recommendations and concluded with an interview, provided the committee with an opportunity to discuss what the triennale could be in 2020 and to choose a director with the vision and capacity to realize a project with artistic and social importance. The shortlist consisted of leading figures from the global art scene and professionals of a very high caliber. However, the proposal submitted by the Delhi-based Raqs Media Collective was decidedly different. Whereas the other candidates were concerned with “trendy” concepts related to today’s most urgent issues, the Raqs Media Collective drew on sources such as a book by a British anthropologist dealing with a day laborer in Yokohama who was well-versed in the philosophy of Gilles Deleuze and Félix Guattari. These sources seemed promising as a means of developing and expanding the concepts that are needed to shape the project. Raqs Media Collective was selected due to our belief that their experience as artists in a variety of places, including Japan, and their proven ability and flexibility as curators would lead to the realization of a truly unique triennale. Among many other issues, the committee discussed the fact that most domestic art festivals have been dominated by Japanese male directors. And as it happened, we settled on an Indian collective of mixed gender. It is my belief that the appointment of Raqs Media Collective will not only serve as an inspiration for the Yokohama Triennale, but also for the Japanese art scene as a whole. With this in mind, one might say that the triennale’s new direction began with the selection process. It is our hope that, like a plant growing and extending its roots, Yokohama Triennale 2020 will transcend a superficial type of globalism and mature into a genuinely international art festival. Raqs Media Collective was formed in in 1992 by Jeebesh Bagchi, Monica Narula and Shuddhabrata Sengupta. The word ‘raqs’ in several languages denotes an intensification of awareness and presence attained by whirling, turning, being in a state of revolution. Raqs Media Collective takes this sense of ‘kinetic contemplation’ so as to make a restless and energetic entanglement with the world, and with time. Raqs practices across several forms and media; it makes art, produces performances, writes, curates exhibitions, and occupies a unique position at the intersection of contemporary art, philosophical speculation, and historical enquiry. The members of Raqs Media Collective live and work in New Delhi, India. In 2001, they co-founded the Sarai program at CSDS (Centre for the Study of Developing Societies) New Delhi and ran it for a decade, where they also edited the Sarai Reader series.